eVic VT Review: 2 Devices, 1 (Clear) Winner! Home → Mods → Box Mods → eVic VT Review: 2 Devices, 1 (Clear) Winner! Steamy salutations, once again, to all you brave smokers who’re finally throwing in the towel…you’re doing the right thing and to all my fellow vaping enthusiasts: I’m glad to see you’re doing your research before splashing out on that next product. The technical nature of vaping gear means it’s always wise to go in for a second opinion from someone who has already had some experience with the product you have in mind; just so that you know what kind of performance to expect and don’t end up disappointed! Today I’m bringing you an eVic VT Review…this little 60W box mod is Joyetech’s addition to the fast growing family of TC devices on the market and I’m keen to see just how Joyetech matches up. Joyetech is, of course, a leading name in vaping tech: no surprise really, seeing as they’ve been around since 2007 and have been steadily improving their game since then. After the release of the original eVic, a wand style vaping pen and a pretty decent device, we were all interested to see the upgrade…hence this review. However, we were all pretty surprised when lo and behold, the second eVic arrives and it’s not a vaping pen at all but a TC box mod…nothing like the original eVic! 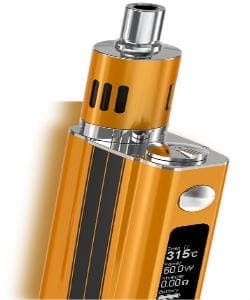 I’m not complaining though, the more box mods I can lay my hands on the better and besides, with racing stripes…60W of power and Temperature Control (Variable Temperature, as Joyetech puts it) for Nickel and Titanium, this could be a fun ride. I’ve even thrown in a review of the Mini version, which was released shortly afterward. Well, I must admit that I love the look of this mod as it’s truly original and unique in it’s class. Featuring a glossy car paint finish, with contrasting racing stripes…it’s reminiscent of a genuine American racing car. The chrome upper surface where the spring loaded 510 connection can be seen is styled to add to this theme and overall I think they’ve done an outstanding job with the superficial design. It’s a pretty straight forward, round edged rectangle but the surfaces where the stripes are have been slightly raised to give that impression of a muscle car’s hood, if you catch my drift. It’s of solid construction with a well placed screen right below the huge, chrome firing button and I’m excited to switch her on and see what this baby can do. One big difference between this mod and other’s in it’s class is that instead of 2 control buttons for adjusting wattage and scrolling the menu, you have a dial type adjuster on the surface where the tank sits. Very strange but cute, it will definitely require practice to get used to. Using a standard Kanthal build on the tank included in the kit and vaping at around 40-50 W. I felt the ramp time was good and I experienced no problems with performance. Now VT (Variable Temp) is Joyetechs version of Temperature Control. When running this mod with Nickel coils (I didn’t try titanium) during this Joyetech eVic VT review, not only did I notice definite in-discrepancies with the resistance readings (they didn’t match my independent resistance checks perfectly) but I also found that the ramp time was not the best. The temp settings seem to be off compared to other TC mods I compared her to, a few degrees lower and a good deal slower to reach temp at the same time. Well, you may need some kind of degree to operate this thing efficiently, let me tell you. Not easy with that thumb dial and all…I had to keep my manual very close throughout this review and could be heard cursing rater loudly throughout. Placement near the top of the mod, definitely not ideal. As I’ve said, this is going to limit the lifespan of your mod, once those batteries are done, you’re done. I also found the battery life wasn’t great at all, though passthrough charge obviously helped a little bit. To learn more about using your Joyetech eVic VT 60W: check out this video! Hot on the heels of the eVic VT was the release of the mini version and it seems Joyetech solved our problems by releasing the new eVic VT Mini: no onboard battery (1x 18650 rechargeable), no thumb dial and in my opinion, all round better performance than the standard VT. Besides those changes, it still has all the functions of the standard model but the difference is they all perform better. They did away with that nasty thumb adjustor. I experienced good ramp time and solid performance with a host of tanks in VW mode. I experienced better performance with the Ni coil and the Ti coil is even more solid. This is the chips for me because sometimes you just want to vape, no questions… and this allows you to bypass the menu and do exactly that. No Stainless Steel support. No Racing Stripes, bleh! Well, as we saw with the swift release of the Mini eVic VT, Joyetech is determined to keep their customers satisfied and if that means dropping their ‘innovative’ thumb dial or their ‘convenient’ onboard battery because the people say “no thanks”…well then that’s exactly what they’ll do. While I didn’t get much joy from my original review…my eVic VT Mini Review did manage to restore my faith in Joyetech to some degree. I’m glad to see that, as a brand, they don’t hesitate to smooth out the cons as they arise and with that I am impressed. I can definitely give my vote on the eVic VT Mini as a great device that’s both powerful and highly portable, suitable for beginner to intermediate vapers who’re on the go and as for the regular eVic VT, not my favorite. During this eVic VT 60 Watt Review, the mini was the clear winner for me!